I'm insane! I started this project when I was in that anxious-ready-to-have-baby-phase! I knew I would start a bunch of projects even though I told myself not to - I just couldn't help myself. Anyway, I decided I was going to stitch all the stamps on one piece of fabric. I started with January. 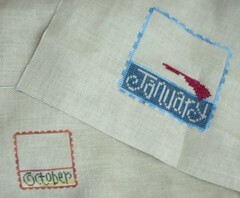 After seeing KathieB's stamps over one I decided to restart them over one (starting at the bottom with October). Now I don't know if that was such a good idea! Over one takes a lot of concentration for me! And the problem is I already cut the fabric. Dh says just get a new piece of fabric, but I don't know ... I think I will like it, it's just not as easy as I thought it would be! :) Write more later! The one over one looks really nice. I love the look of one over one but I hate doing it. Doing it on 28 or 32ct isn't bad but anything higher I try to pass on. Oooh, they look great over one! IIt would look great over one. I understand about it requiring concentration-ecause I decided to do the Crescent thread packs all over one.